Can a fish have a Christmas tree? It's not usual... As we know, Christmas is not very beneficial time for fishes as they often end up on a plate rather than at a Christmas tree. But Alvin is rather different: He lives in the sea when he finds a book about Christmas in an old shipwreck - and he falls in love with an image of Christmas tree. Can he have it? Alvin fish celebrates Christmas is a classic hand-drawn adventure game for everyone. 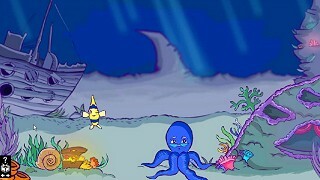 Alvin discovers places in the sea and collects various items which he uses to get his dream Christmas tree. The game is ideal for small children, with whom their parents can play, but also for all the others - as it offers the opportunity to discover sea mysteries and to experience Christmas as you've probably never experienced them before.